Biodiesel is a domestically produced, renewable fuel that can be manufactured from new and used vegetable oils, animal fats, and recycled restaurant grease. Biodiesel's physical properties are similar to those of petroleum diesel, but the fuel significantly reduces greenhouse gas emissions and toxic air pollutants. It is a biodegradable and cleaner-burning alternative to petroleum diesel and can be blended and used in many different concentrations. 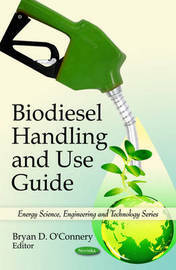 The most common biodiesel blend is B20, which qualifies for fleet compliance under the Energy Policy Act (EPAct). B100 or higher blend levels such as B50 require special handling and may require equipment modifications. These issues can potentially be managed with heaters and/or changing engine seal and gasket materials. This book provides basic information on the proper and safe use of biodiesel and biodiesel blends in compression-ignition engines and boilers, and it is intended to help fleets, individual users, blenders, distributors, and those involved in related activities understand procedures for handling and using biodiesel fuels. This book consists of public documents which have been located, gathered, combined, reformatted, and enhanced with a subject index, selectively edited and bound to provide easy access.